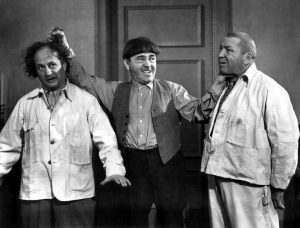 I can’t believe it has been about ten years since news broke that the Farrelly Brothers would be adapting a big screen adaptation of the beloved comedy trio, “The Three Stooges”. So many stories and casting news has been written and tons of rumors have surfaced about this film. Well it looks like the Farrelly Brothers will have made their final casting decisions for their “Three Stooges” by the end of this coming week. Peter and Bob Farrelly are known for directing comedies such as: “There is Something About Mary”, “Me Myself and Irene”, and “Dumb and Dumber”. Now add to that list “The Three Stooges”. It is said that Will Sasso (MadTV, Drop Dead Gorgeous, Sh*t My Dad Says) is a lock to play Jerome “Curly” Howard. Hank Azaria (The Simpsons, The Birdcage, Godzilla) is the frontrunner to play “Moe” Howard. James Mardsen (X-Men, Enchanted) looks to be the first choice for “Larry” Fine. It was originally to be voice actor, Billy West (Futurama, Ren and Stimpy), but it looks like they want a better looking guy for the role. Sorry Billy. I would have chosen you. This is all according to Deadline. This is a very touchy project I feel. The original Stooges are so perfect in so many ways. It is going to be extremely difficult for the Farrelly brothers to pull a remake off. I do have faith in them though. This entry was posted on Monday, March 28th, 2011 at 12:00 am	and is filed under Film, News. You can follow any responses to this entry through the RSS 2.0 feed. You can skip to the end and leave a response. Pinging is currently not allowed. « Check Out The Trailer for The New “Three Musketeers” Film!! !